Boy, I haven’t been very good at updating this little blog. I have been trying to get a little more creative in the kitchen recently, after getting a library card and deciding to get a new cookbook every visit. I have been reading these cookbooks like novels. I love it. One thing I have to say, I am very annoyed when I get to a recipe that sounds delicious and the cookbook tells me to MICROWAVE ingredients. No. I will not. I sold my microwave in a yard sale and replaced it with a toaster oven because it was just a flashy bread box prior. Personally, I have always been bothered by microwaves. I don’t like the idea of “nuking” food so that it warm or hot or softened or really anything. I find that it warps the flavors and it probably is warping the genetic make-up. I didn’t want to even have it plugged into the wall!! BEGONE! So one of the recipes in the most recent cookbook was “Baked Papaya with Coconut Milk” which wasn’t baked at all, but much rather microwaved. I also had an issue with the size of the papaya in the recipe. 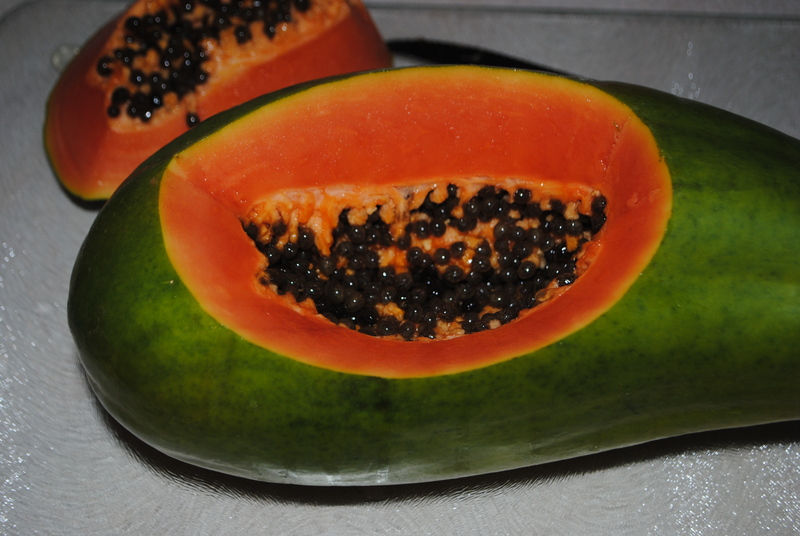 My grocery stores only had papaya that were at least double the size of the one used in their recipe( I guess because I am closer to the source). Needless to say, I have revamped the recipe. It takes a bit of time but it’s something you can put in the oven while you are cooking dinner and then on to the counter while you eat. Warm your oven to 350 degrees, fahrenheit. Clean and dry your papaya, then lay it on it’s side, trying to find a nice flat stable base. If it is too rounded all the way around, make a base by using a knife and simply cutting a flat area. Once your papaya is situated, cut a ‘lid'(think of when you are carving a pumpkin, work on an angle so that the lid sits nicely on top and doesn’t fall in). Remove the cap and then spoon out the seeds. 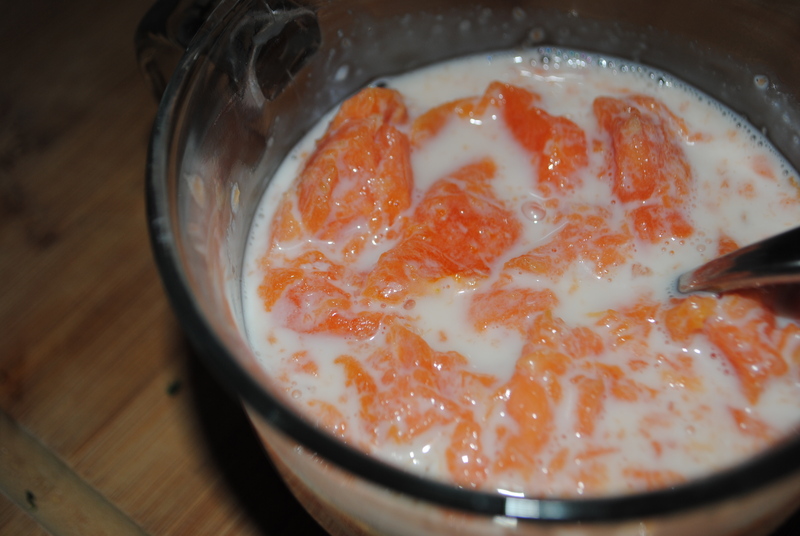 Mix your ‘milks’ and then put them inside. 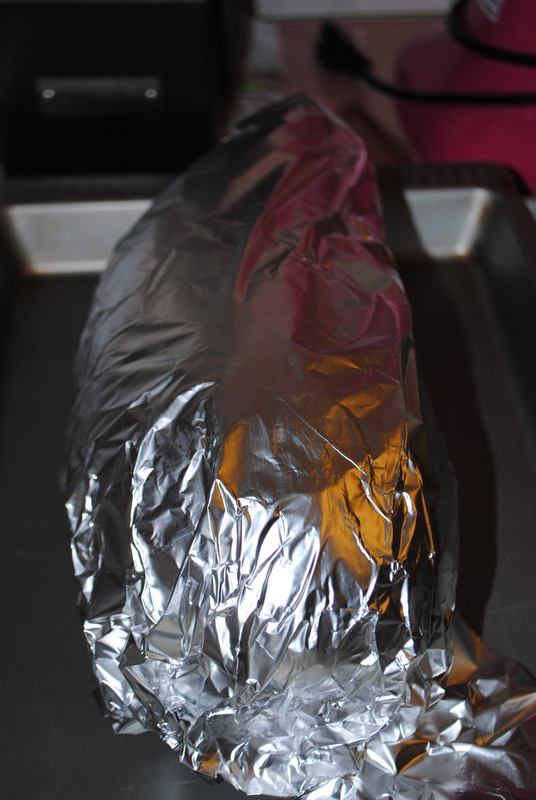 Replace the cap and then top your papaya with foil and onto a cookie sheet. Pop it into the oven and let it bake for 30 minutes. After the time is up, remove from the oven and let it sit on the counter for 20-30 minutes. You can eat it immediately but this allows the temperature to cool so you can have a warm dessert rather than a blazing hot dessert. Remove the foil, pull off the lead and then spoon out the ‘meat’ of the papaya and coconut milk mixture into a bowl or cup. Act like you are on vacation while you are savoring your dessert! This entry was posted in Uncategorized and tagged 3 ingredients, coconut, condensed, cuisine, dessert, easy, fancy, japan, japanese, milk, papaya, simple by themcdorkins. Bookmark the permalink.